The teaching about guardian angels is not a myth; certain groups of human beings do actually have personal angels. It was in recognition of this that Jesus, in speaking of the children of the heavenly kingdom, said: "Take heed that you despise not one of these little ones, for I say to you, their angels do always behold the presence of the spirit of my Father. " The subnormal minded—those who do not exercise normal will power; those who do not make average decisions. This class embraces those who cannot comprehend God; they lack capacity for the intelligent worship of Deity. The subnormal beings of Urantia have a corps of seraphim, one company, with one battalion of cherubim, assigned to minister to them and to witness that justice and mercy are extended to them in the life struggles of the sphere. The average, normal type of human mind. From the standpoint of seraphic ministry, most men and women are grouped in seven classes in accordance with their status in making the circles of human progress and spiritual development. The supernormal minded—those of great decision and undoubted potential of spiritual achievement; men and women who enjoy more or less contact with their indwelling Adjusters; members of the various reserve corps of destiny. 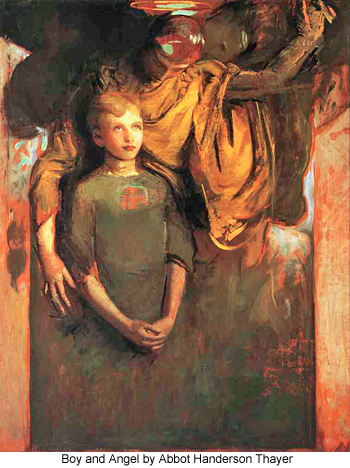 No matter in what circle a human happens to be, if such an individual becomes enrolled in any of the several reserve corps of destiny, right then and there, personal seraphim are assigned, and from that time until the earthly career is finished, that mortal will enjoy the continuous ministry and unceasing watchcare of a guardian angel. Also, when any human being makes the supreme decision, when there is a real betrothal with the Adjuster, a personal guardian is immediately assigned to that soul. In the ministry to so-called normal beings, seraphic assignments are made in accordance with the human attainment of the circles of intellectuality and spirituality. You start out in your mind of mortal investment in the seventh circle and journey inward in the task of self-understanding, self-conquest, and self-mastery; and circle by circle you advance until (if natural death does not terminate your career and transfer your struggles to the mansion worlds) you reach the first or inner circle of relative contact and communion with the indwelling Adjuster. Human beings in the initial or seventh circle have one guardian angel with one company of assisting cherubim assigned to the watchcare and custody of one thousand mortals. In the sixth circle, a seraphic pair with one company of cherubim is assigned to guide these ascending mortals in groups of five hundred. When the fifth circle is attained, human beings are grouped in companies of approximately one hundred, and a pair of guardian seraphim with a group of cherubim is placed in charge. Upon attainment of the fourth circle, mortal beings are assembled in groups of ten, and again charge is given to a pair of seraphim, assisted by one company of cherubim. The instant the pilot light in the human mind disappears, the spirit luminosity which seraphim associate with the presence of the Adjuster, the attending angel reports in person to the commanding angels, successively, of the group, company, battalion, unit, legion, and host; and after being duly registered for the final adventure of time and space, such an angel receives certification by the planetary chief of seraphim for reporting to the Evening Star (or other lieutenant of Gabriel) in command of the seraphic army of this candidate for universe ascension. And upon being granted permission from the commander of this highest organizational unit, such a guardian of destiny proceeds to the first mansion world and there awaits the consciousizing of her former ward in the flesh. In case the human soul fails of survival after having received the assignment of a personal angel, the attending seraphim must proceed to the headquarters of the local universe, there to witness to the complete records of her complement as previously reported. Next she goes before the tribunals of the archangels, to be absolved from blame in the matter of the survival failure of her subject; and then she goes back to the worlds, again to be assigned to another mortal of ascending potentiality or to some other division of seraphic ministry. But angels minister to evolutionary creatures in many ways aside from the services of personal and group guardianship. Personal guardians whose subjects do not go immediately to the mansion worlds do not tarry there in idleness awaiting the dispensational roll calls of judgment; they are reassigned to numerous ministering missions throughout the universe. The guardian seraphim is the custodial trustee of the survival values of mortal man's slumbering soul as the absent Adjuster is the identity of such an immortal universe being. When these two collaborate in the resurrection halls of mansonia in conjunction with the newly fabricated morontia form, there occurs the reassembly of the constituent factors of the personality of the mortal ascender. The Adjuster will identify you; the guardian seraphim will repersonalize you and then re-present you to the faithful Monitor of your earth days. And even so, when a planetary age ends, when those in the lower circles of mortal achievement are forgathered, it is their group guardians who reassemble them in the resurrection halls of the mansion spheres, even as your record tells: "And he shall send his angels with a great voice and shall gather together his elect from one end of the realm to another. " The technique of justice demands that personal or group guardians shall respond to the dispensational roll call in behalf of all nonsurviving personalities. The Adjusters of such nonsurvivors do not return, and when the rolls are called, the seraphim respond, but the Adjusters make no answer. This constitutes the "resurrection of the unjust," in reality the formal recognition of the cessation of creature existence. This roll call of justice always immediately follows the roll call of mercy, the resurrection of the sleeping survivors. But these are matters which are of concern to none but the supreme and all-knowing Judges of survival values. Such problems of adjudication do not really concern us. Group guardians may serve on a planet age after age and eventually become custodians of the slumbering souls of thousands upon thousands of sleeping survivors. They can so serve on many different worlds in a given system since the resurrection response occurs on the mansion worlds.